On the page, there is really nothing very remarkable about this cheese. Paneer is a bland cheese made popular in Indian cuisine. It is a vehicle designed to bring dishes to life through its absorption of complex spice and flavor combinations. 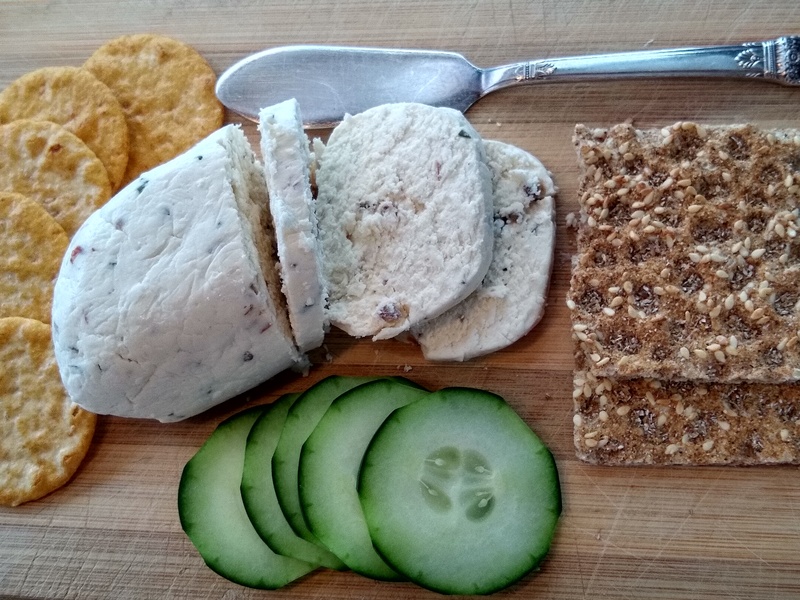 Paneer is one of the easiest and most rewarding in my (fairly limited) repertoire of homemade cheeses. You can have your cheese fix in three hours. Bring some milk to a boil, add the juice of a couple of lemons to expedite the curdling process, and you are on your way. In all of its simplicity, this cow’s milk variety is reminiscent of a highly crafted goat cheese. No, it is not a creamy cheese, and oddly, its mouth feel is slightly dry. But if you take a few exotic spices and throw them into the mix, something happens. It could be that I am a huge fan of coriander seeds… give it another dimension with red pepper flakes and freshly ground black pepper. Add a little fresh garlic chives, a nice dash of salt and that is it. Once it drains and curds form, press briefly to mold it into shape. Give it a quick chill to solidify and allow flavors to blend. If you can wait, it’s even better the next day! Yes, paneer is a real team player. You could say Spiced Paneer is a case of the whole being greater than the sum of its parts. It needs nothing else… maybe a cracker or two. Rinse a large pot with water and pour in the milk; add the peppercorns and coriander, and place it over medium high heat. Stirring with a flat bottom spatula, bring to a full boil. Gently stir in the lemon juice and remove from heat. Let stand undisturbed to allow it to separate into curds, which will take about 10 minutes. Meanwhile line a colander with cheesecloth and place it over a bowl to catch the whey. Pour the curdled mixture into the cheesecloth lined colander and allow to drain. When the liquid has drained through, carefully, bring the corners of the cloth together to bring the curds together in a mass, drain for 10-20 minutes longer. When the curds have stopped dripping, give it a good squeeze to remove any further whey. Gently stir in the salt and redistribute any spices that may have shifted to the bottom. Shape the mass into a flat round or oval and firmly rewrap in the cheesecloth. Set the cheese on a drainable surface (like a sushi mat) and weigh it down with a heavy pot filled with water or a couple of cans. Let it stand undisturbed at room temperature for 2 hours. Remove the cheesecloth and gently reshape the cheese into an attractive log or oval. Cover with clean cheesecloth and firmly wrap with plastic wrap. Chill for 2 hours or preferably overnight to allow the paneer to solidify. Yield: about 10 oz. You never know when good fortune will cross your path. For some time now I’ve been making my own yogurt, thanks to the ease and convenience of the ole Instant Pot. Once committed to the process, my results have become far superior to any of the usual store bought varieties. When I discovered one batch could yield two distinct styles I got even more excited: I’d have a quart of fine yogurt for daily use, plus a good supply of thick, creamy Greek yogurt worthy of cheese status. During my early Greek yogurt period, I came across Home Cheese Making (3rd edition) by Ricki CarrolI, while browsing books at a used book sale. (Ricki has a 4th edition coming out December 2018). It looked nearly new (good/bad sign, whatever), I added it to my stack and brought it home. Several days later, I opened the book and knew this was no mistake. I haven’t met a cheese that I didn’t like, and here was an opportunity to see where all this could possibly go. Ricki’s well laid-out book takes a complicated subject and breaks it down into manageable chunks. 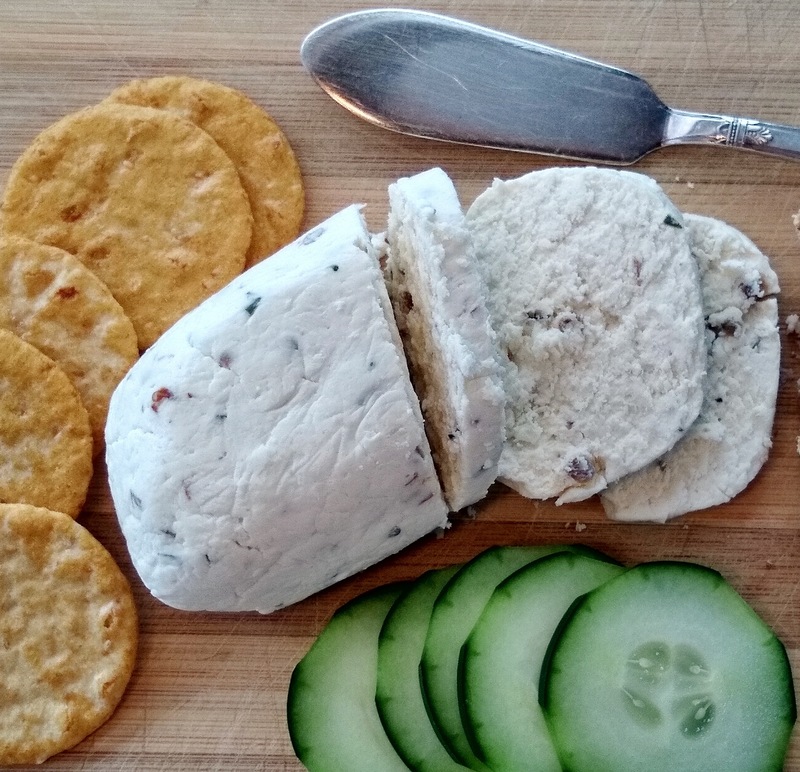 It’s geared to the novice as well as the skilled cheese maker, with a wide range of cheeses to consider from soft fresh cheeses like queso fresco, mozzarella, and feta, to ripened cheeses like cheddar, gouda, brie, and much more. Here, I could begin to understand and more fully appreciate the art of cheese making—and I was ready. 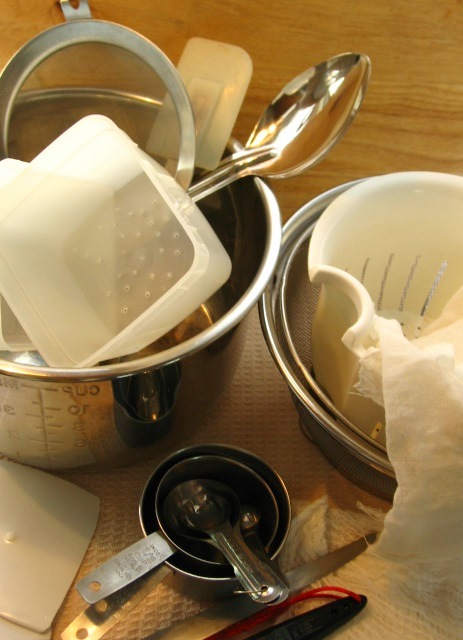 You can get started in cheese making with a few basic kitchen supplies. A good digital thermometer is a must, plus a colander, cheesecloth, a long spoon or spatula, the usual measuring cups and spoons, a long knife for cutting the curd, a stainless steel pot, and a reliable cooking unit that maintains a steady temperature. Each cheese requires specific additives for its success. Some of the basics are: a starter such as yogurt, a mesophilic or thermophilic starter; liquid rennet for coagulation; calcium chloride for curd formation; lipase powder for flavor; and cheese salt. Sourcing cheese making supplies can be a hassle, but I’ve had good luck with Ricki’s website, New England Cheese Making Supply Co. It is a reliable resource for cheese making information and supplies. Thus far, my biggest success comes from making feta cheese. If you happen to read the previous post, Feta Focus, you’ve absorbed a few feta details. Essentially, Greek feta has earned its own provenance: much like a European wine appellation, it must be made with either sheep and/or goat’s milk. I’m keeping it simple at this point, I am happy staying with familiar and readily available: whole cow’s (not ultra-pasteurized) milk. Feta cheese is fairly simple to make. I used a sous vide with my first batch, which was entirely unnecessary. The second time, I filled my well-scrubbed kitchen sink with 90° hot water, placed the covered milk-filled stainless steel pot into the warm water bath, and stirred occasionally until it reached 86°. That’s when the starter culture and ultimately the rennet are introduced and the curd making process unfolds. I added more regulated hot water as needed to maintain the temperature. Once the curds have formed, the process moves along fairly quickly. It’s important to allow time for the curds to drain well. 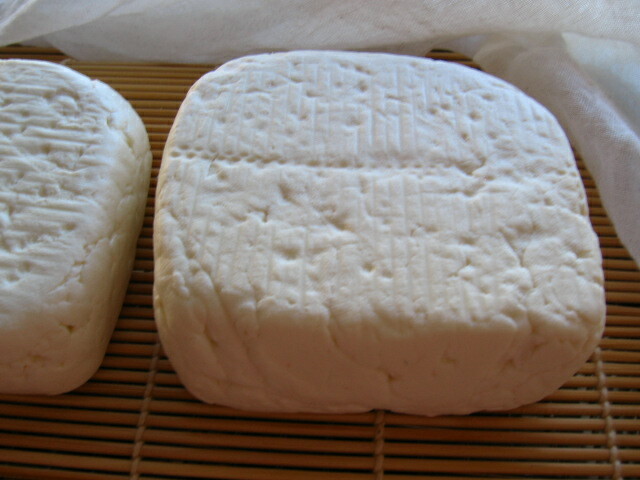 Once draining has slowed significantly and forming a mass, the cheese is placed in molds for shaping and further straining. It’s then briefly placed in a brine solution for a quick rest to stabilize the feta before turning out onto a mat to dry. Utensils: Digital thermometer, large stainless steel pot, large spoon & perforated scoop, colander, measuring cup & spoons, curd knife like a boning knife, cheesecloth or butter muslin, 2 perforated molds, sushi mat. Warm the milk in a stainless steel pot to 86°F. As milk is heating, stir in the diluted lipase and the diluted calcium chloride. When brought to temperature, sprinkle in the starter culture and stir Cover and let milk ripen for 1 hour. Add the diluted rennet and stir gently with spoon in an up-and-down motion (not a stirring motion) for several minutes. Cover and let set undisturbed at 86°F for 1 hour until it has gelled, separates from side of pot, and there is a clean break in the curd when sliced with a knife. Using a long knife cut the curd at an angle. Turn the pot and slice into 1/2-inch cubes all the way to the bottom. Repeat if necessary. Let rest for 10 minutes. Gently stir the curds on and off for 20-30 minutes. As the curds firm and retract, stir more briskly. Line a large colander with a double layer of cheesecloth or butter muslin and place a bowl under it to catch the whey. Scoop in the curds and let excess whey drain off 2 hours. Once dripping has stopped divide into 2 cheesecloth lined perforated molds and weigh down. Turn often in molds to drain for 4-6 hours, regularly rotating to weight evenly until no more liquid collects. To stabilize feta, place the blocks in brine and weight down to keep submerged 1 Tbsp. salt per 1 cup unchlorinated water to cover for 4-5 hours. 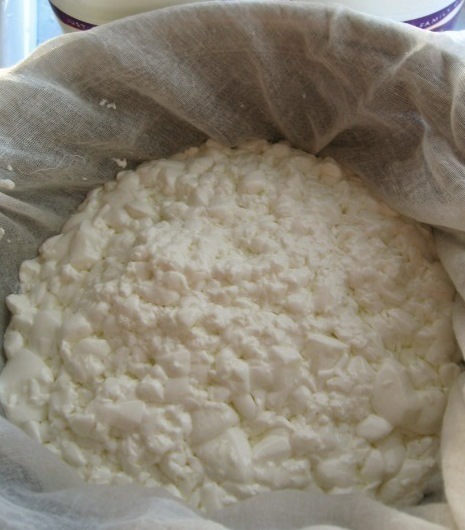 Remove feta to mat, cover loosely with cloth, refrigerate for 1-3 days to drain and air dry. Turn several time daily. 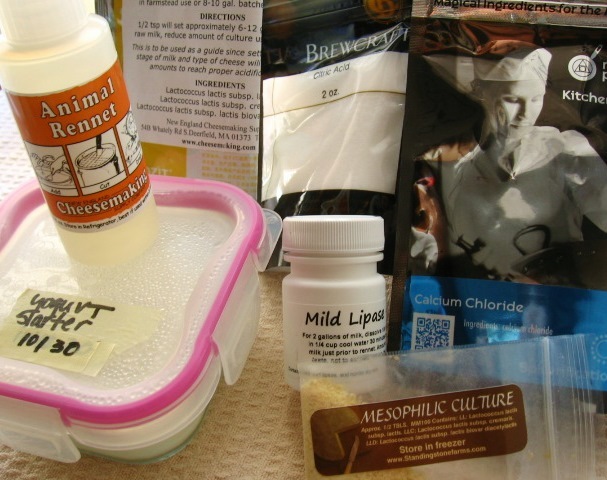 Brine can be filtered and reused. Return feta to storage brine. Refrigerate 4-5 days, or up to 30 days. Yield: 1 pound. Feta is a fresh, briny cheese often associated with foods rooted in the sun-drenched Mediterranean cuisines – think olives, capers and vegetables like eggplant, zucchini, cucumbers, and tomatoes. Here in the US, feta is often made from cow’s milk which produces a pleasantly mild, slightly tart cheese. To be called feta in the European Union, it must originate in Greece and be limited to sheep and or goat’s milk, thus offering a rich panorama of flavors and textures. Depending on process and aging time in brine, Greek feta can vary in saltiness, range from soft to hard textured, and taste from tart to tangy. 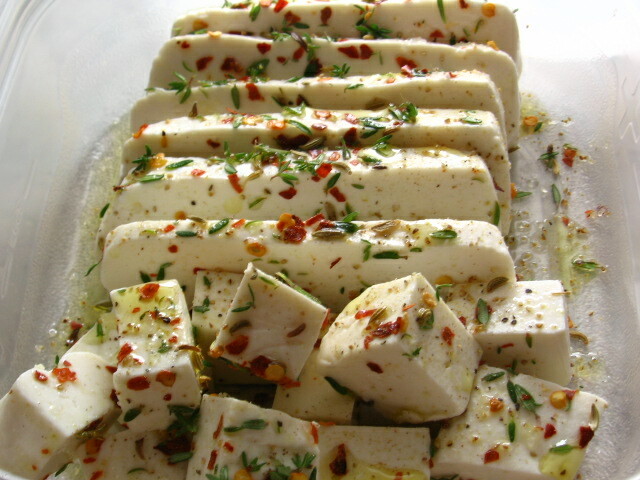 One popular treatment is to submerge bite-sized feta cubes in olive oil along with assorted herbs, garlic and such, and allow the marinade to infuse into the cheese; the longer the better. That is certainly lovely with a robust cheese that responds to big flavors, but beware of overpowering a mild flavored feta. To better showcase feta’s more subdued qualities, I prefer to deconstruct the whole concept. For this simple method, begin with a block of feta, slice it for easy serving, sprinkle it with herbs and seasonings, and drizzle it lightly with olive oil. Cover it and allow the flavors to meld for an hour or so in the fridge. When ready to enjoy, bring the marinated feta to room temperature, perhaps drizzle with a bit more olive oil if it appears dry, and garnish with fresh herbs. Serve with an assortment of olives, crusty bread, pita crisps or crackers, pass a bowl or crunchy radishes, and call it good! 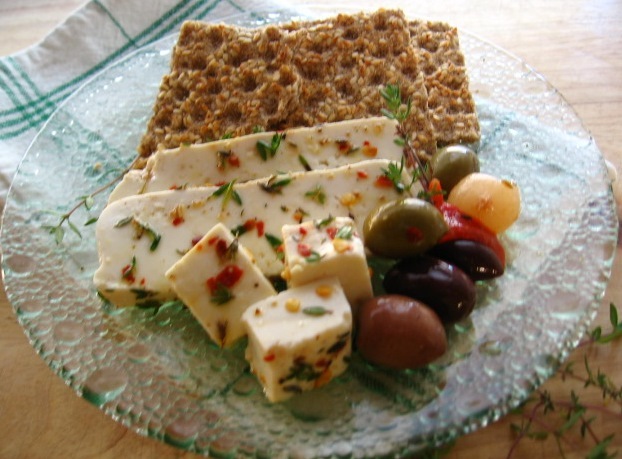 Slice the feta and arrange it on a serving plate. Sprinkle the cheese with herbs and red pepper flakes. Drizzle lightly with olive oil. Cover and chill for an hour or longer. To assemble, drizzle with a bit more olive oil if it looks dry, dust with grinds of salt and pepper. Garnish with fresh thyme, assorted olives. Serve with crunchy bread, crackers or pita crisps, and a bowl of fresh radishes. Serves 4. It is all a matter of taste, and opinions on the grilled cheese sandwich are legendary. Folks are very picky about their sandwiches and you just don’t mess with this one. What about the cheese? Should it have Swiss or American cheese? Or do we go off the deep end and prefer blue cheese and pears? What about mustard? Preferences here can run deep and strong; it’s a very hot topic, indeed. Of course, the bread is an important factor. Here, we begin with an inoffensive Buttermilk White Bread. It’s not too soft and not too dense. It’s a good size, not too big and not too small, but large enough to trim the crust – if an issue. For the cheese, we stay in the middle with a compromise, and go with a slice each of Swiss and American, plus a light schmear of deli mustard in between for good luck. The bread is lightly buttered on the exterior sides only. That is it. Grill both sides over moderately low until crispy, golden, and gooey. Enjoy with a steamy cup of tomato soup and dip away! Over medium low heat, preheat grill/pan. Spread butter on 1 side of the bread slices. Place one slice, buttered side down in pan. Layer it with Swiss cheese spread with a light schmear of mustard and then the American cheese. Top with 2nd slice of bread, buttered side up. I bought a jar of tahini the other day and cannot leave it alone. It should be sold with a warning label. I am hooked. I put tahini on or in everything, and it keeps tasting better. I write these words as I eye my latest showstopper. I am worried because I may polish this cheesecake off before the sun comes up. It all began with my musing over the possibilities of a tahini cheesecake. Mmmm. That’s when the not-so-obvious addition of turmeric registered. Now that’s intriguing. Yes, turmeric interests me, too. I want to explore its rumored health advantages, its lovely color, its mysterious flavor… But, wait! Why not throw in a gingersnap and date crust and see what happens? I hit the kitchen and gather up what’s on hand: Greek yogurt and Neufchatel cheese. Ah, yes. Elegant, nuanced… a bit of honey for sweetener is spot on. Into the pressure cooker it all goes for 30 minutes. That’s it. Well, what can I say? The filling’s golden color is worthy of a Van Gogh painting. The flavor is subtle—yet profound. It evokes the question, “Is it really that good?” Perhaps another bite… or two. Ah, yes, it is certainly good for me. I have no shame. Call the doctor. Spray a 7” springform pan with non-stick spray and line bottom with parchment. For the crust: crush the cookies into fine crumbs, using either a food processor or a ziploc bag and rolling pin. Stir in the melted butter. When well combined add the dates and stir to distribute evenly. Press the mixture onto the bottom of a 7-inch springform pan, pressing firmly and spreading the crust about halfway up the sides of the pan (the bottom of a drinking glass works well for this job). For the filling: toast the turmeric in a small bowl in the microwave about one minute, until aromatic. In mixing bowl, beat the cream cheese until light. Whip in the tahini, then the turmeric honey, vanilla and sea salt until well combined. Add Greek yogurt and whip until smooth. , sugar and vanilla in a large bowl, and whip together until very smooth. Then add the eggs, mixing until just combined. Pour the filling into the springform pan, being careful to fully cover the crust around the edges (if any crumbs are exposed, they can become soggy from the moisture in the pressure cooker). Place a trivet rack into the pressure cooker, and pour in 1 cup of water. Place the cheesecake on top of the trivet and close the lid. Set the valve to sealing position, and cook on high pressure for 30 minutes. When done, turn off cooker and let stand for 5 minutes without disturbing, then release pressure. Open the lid and use the trivet handles to lift out the pan. If water has settled on top of the cheesecake, gently blot any excess with a paper towel. Allow the cheesecake to cool on a rack at room temperature for 1-2 hours, then transfer it to the refrigerator to chill completely (at least 4 hours). Serves: 1 to 8.
Who doesn’t love a good Reuben sandwich? What a combination. A flavorful dressing spread on pumpernickel or rye bread and topped with layers of corned beef, sauerkraut, and Swiss cheese. It’s definitely over the top when grilled until toasted and the cheese is melted. Here’s a Reuben riff that brings it into the realm of mass production for entertaining and game days. It’s an open-faced sandwich that can be prepped ahead and run under the broiler for a last minute fix. My chief hang-up on the Reuben has always been the sandwich spread, with a definite thumbs down on sweet ones, like Thousand Island and most Russian dressings. A simple solution is to go with a straight forward, unadulterated combination of mayonnaise and sriracha with a little minced green onion for interest. For maximum compatibility, serve these tasty morsels with sour dill pickles and crunchy sweet potato chips. For dressing: blend the mayonnaise and other ingredients and set aside. Preheat broiler. Set rack about 6” from top. Warm the sauerkraut. Slice the corned beef into 1-1/2” strips to fold neatly across the rye. Cut the Swiss cheese slices into quarters. Arrange cocktail rye slices on a baking sheet. Spread each slice liberally with a heaping teaspoon of dressing. Fold the corned beef in 2-3 layers over the bread. Drape a forkful of sauerkraut across the corned beef. Cover the sauerkraut with 2 pieces of Swiss cheese. 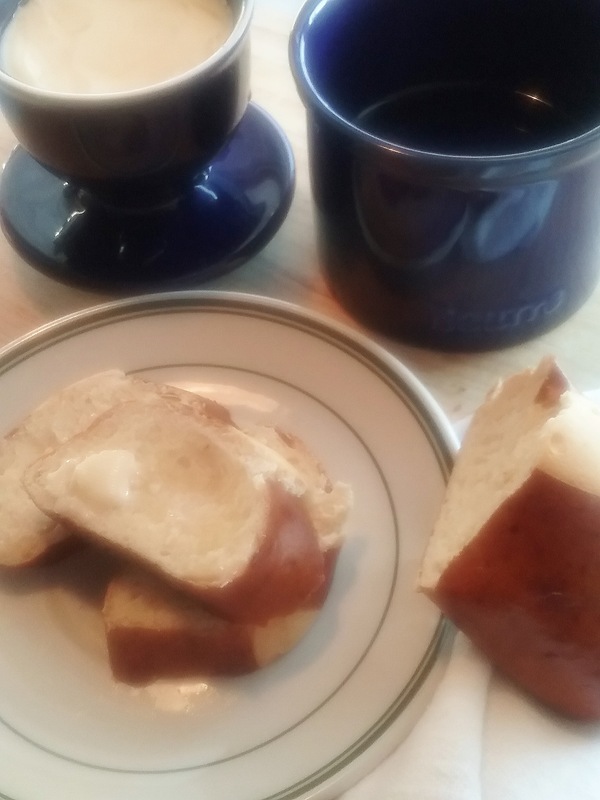 The convenience of having soft spreadable butter within arm’s reach is a wonderful thing, especially when warm bread is around. But, it can be hazardous to ones health. I only say that as a friendly reminder to those of us who received butter crocks for Christmas. For anyone unfamiliar with this cleaver amenity, the butter is suspended in water as a way of preserving it at room temperature for up to 30 days. This is not a new idea. For centuries folks have known this to be a welcome safety method when refrigeration was not an option. The French have benefited by this practice, and I say, if it’s good enough for them, it’s good enough for me. To a degree. Perhaps they are able to show more restraint than I. It’s important to regularly sample my butter, I reason, to make certain of its creamy texture and delicate flavor, and that is it is soft, spreadable, and safe. Now, I am looking for French and imported butters, purely for comparison purposes, you understand. It’s my job to know these things. 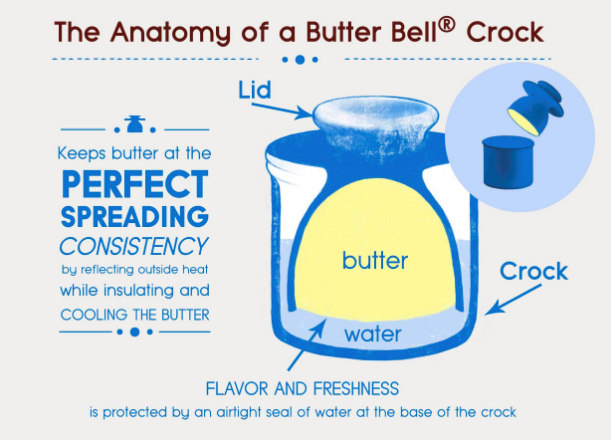 I am completely smitten by my new butter crock and reason this is all purely educational. Which also means that the butter is bypassing my hips and waist at this time. No matter, I tell myself. It’s the holidays.